You’re in a maze of twisty little passages, all different. The aft cabins are really fun places to work. There is basically not a straight surface anywhere. The frames and hull curvature changes rather a lot in quite small distances. And there are lots of corners and boxes protruding into the cabin from all sides, because of various installations around them. So it wasn’t easy, but now the port cabin is done and I am quite pleased with the result. 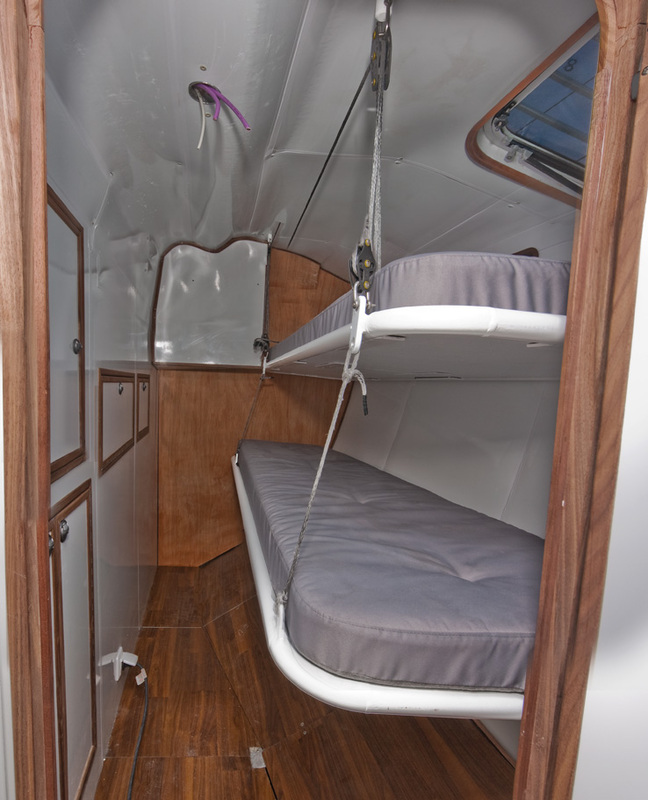 As you can see, the berths are a mix between a racer’s sea berth and a traditional comfortable cruiser bed. They are wide and have nice cushions, but they are also adjustable to the yachts heel angle. A thin cushion against the wall will be added later as well. I use a 3:1 dinghy sheeting system for the adjustment, so you can even adjust the angle from the top berth without getting out of it. Well… maybe not if there are two very heavy guys sleeping. But I can do it myself when I’m in the bed, anyway!